The Edinburgh zoo is located to the north east of the city centre and is considered one of the best in the world. With a history spanning several decades, the zoo at Edinburgh has over 1,000 species of animals. This zoo has the distinction of housing the biggest colony of penguins. The zoo at Edinburgh is run by the Royal Zoological Society of Scotland. The Royal Edinburgh Zoological Gardens was established in 1839 but ran into difficulties in a couple of decades. It was nearly half a century later that Thomas Gillespie set out to revive it. Today, the Edinburgh zoo attracts thousands of visitors each year. This zoo covers an entire hillside in Corstorphine and allows animals to roam in their natural habitat. There is a special enclosure for penguins with glass slides that allow visitors a wonderful view of them gliding through the water. 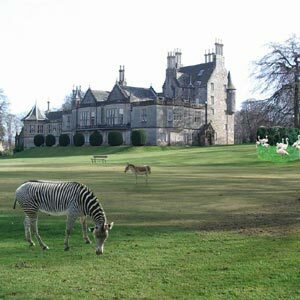 The Edinburgh zoo specializes in the breeding of the Rothschild's or Baringo giraffe - one that is characterized by a darker centre and occasionally two pairs of horns. The snowy owl is yet another breeding success of the Edinburgh zoo. The zoo is well known for its pioneering work in breeding programmes, research and conservation.